Just when you thought MusicfestNW couldn't get any better, it does. 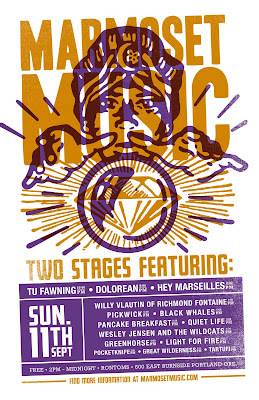 Marmoset Music is hosting a free two stage day-long party at Rontoms on Sunday September 11th, featuring cheap beers and some of my favorite local and regional bands. This is godsend if you are like me and going to miss Dolorean on Thursday at Bunk Bar (I'll be at Charles Bradley). But I'm just as excited to see Light For Fire and Black Whales, both of which have great new albums out. And then there's Pancake Breakfast and Hey Marsailles. Judging from the set times, it is going to be nonstop music from to 2 to 11, so I'll probably be there as soon as the bacon washes away the hangover and kicking it until I'm ready to drop. Set times after the jump.